A University of Illinois at Chicago-developed breast cancer drug that has the potential to help women whose cancer has stopped responding to hormone therapy recently entered its first human clinical trial. Breast cancer affects one in eight women in the United States, and while there are many types of breast cancer, around 80 percent are categorized as estrogen receptor-positive, or ER-positive. This means the cancer cells have receptors – molecules that can receive signals from chemicals in the body – that are sensitive to and react to the hormone estrogen. In the case of ER-positive breast cancer, this means that estrogen fuels cancer growth. To treat this type of breast cancer, doctors prescribe medication to block hormone production in the body or interfere with the effect hormones have on cancer cells. This type of treatment is called hormone therapy. 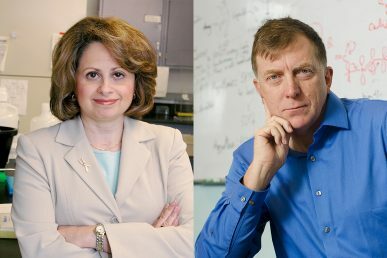 “Hormone therapy is considered to be highly effective at fighting estrogen receptor-positive breast cancer, but nearly half of all women who undergo this type of treatment still develop a resistance to the medication and experience a recurrence,” said Debra Tonetti, associate professor of pharmacology and head of biopharmaceutical sciences in the UIC College of Pharmacy. Tonetti, who is one of the developers of the new drug, called TTC-352, says the drug may be just as effective at treating breast cancer as other hormone therapy drugs, like tamoxifen or aromatase inhibitors, but with fewer side effects. To develop the drug, Tonetti worked with Greg Thatcher, professor of medicinal chemistry and pharmacognosy. Together, they tested the drug first in the lab, then in animals. “Preclinical studies have shown that TTC-352, which is a selective estrogen mimic, causes complete tumor regression, but unlike tamoxifen, may pose a reduced risk of uterine cancer development,” Tonetti said. In July 2017, the U.S. Food and Drug Administration approved the drug, which UIC has licensed to TTC Oncology, LLC, for trial in humans. The Phase I human trial will determine the maximum tolerated oral dose of TTC-352 in patients with metastatic breast cancer that has progressed despite endocrine therapy. It will also evaluate patient best response to treatment, duration of progression-free survival, duration of overall survival, the safety profile of the drug and the drug’s pharmacokinetic profile. The study will also investigate the association between tumor response to the drug and its expression of a specific predictive biomarker: protein kinase C alpha, or PKC alpha. “We have observed that breast cancers that develop a resistance to hormone therapy have elevated PKC alpha expression and our previous studies suggest that PKC alpha may predict a positive response to estrogen mimics like TTC-352,” Tonetti said. Tonetti says if the trial results are positive and if patients’ response to the drug is correlated with PKC alpha expression, TTC-352 has the potential to become a first line therapeutic drug for patients with estrogen receptor-positive breast cancer that expresses the biomarker. The trial is now open at two sites: Regions Cancer Center in St. Paul, Minnesota, and the Virginia G. Piper Cancer Center in Scottsdale, Arizona. UIC will analyze the tumors for the PKC alpha biomarker. TTC Oncology funds the study.